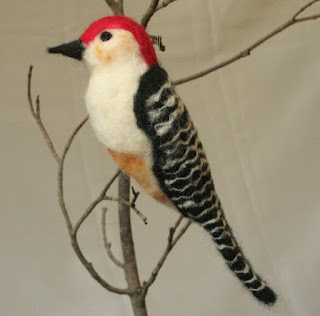 I think that this is a funny name for this bird - it seems like it should be called a red headed woodpecker, right? But there is another named red-headed, so this bird gets named after its belly - which isn't even truly red! Anyway, no matter what it's named, I was thrilled to have one at the bird feeder this winter. I haven't seen him in quite a while, since I stopped putting out suet. The ways of nature...this morning I was sitting by the window and saw a couple of crows in the yard. I figured they were up to no good, and I was right. They chased the robin off her nest and raided it, stealing the eggs. I was saddened, but that is the way of things, I guess. I wonder if the robins will try again with this nest or whether they will build a new one in a more hidden place. 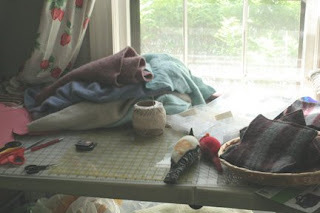 This is what my worktable looks like today. I'm tagging the stuff I made last week, have a bunch of things ready to sew, and a bunch of sweaters ready to cut up. They are angora/lambswool and cashmere, so I can't wait to get my hands on them. But I have resolved to sew the ones I've already cut before cutting more. Ah, discipline!